From site preparation to turf selection, you’ll get the right advice from Colliers. With more than 48 years experience in the turf industry, Colliers know everything there is to know about turf from the subsoil up. We’re happy to share that expertise whether it be the best grass type for your locality, help with measuring and calculating the amount of turf you need, we can even recommend who’s best in your area to lay your turf. Colliers Turf started in the Samford Valley, just outside of Brisbane. Turf wasn’t cultivated in those days, it was a natural grass which we would purchase from the local dairy farmers. We started off with a 12 inch Ryan self propelled turf cutter (which we still have) that would cut the turf into 30 metre strips. Those strips then had to be rolled by hand into 2 metre lengths. Our first turf farm consisted of 12 acres of Turf and since then we have had several farms and have experimented with several varieties of grass. It takes years of experience and hard work to produce the best product available. We take pride in the knowledge we have gained and are only too happy to share this with our customers. In 2002 we were licenced to grow Sir Walter which seems to cater for all situations and climates. Our turf is now cut with a Kesmac machine and palletised for easy handling and quicker service. Above all else, we pride ourselves with honesty and good service and are always available to share our advice. Don’t hesitate to contact us if we can be of any assistance. 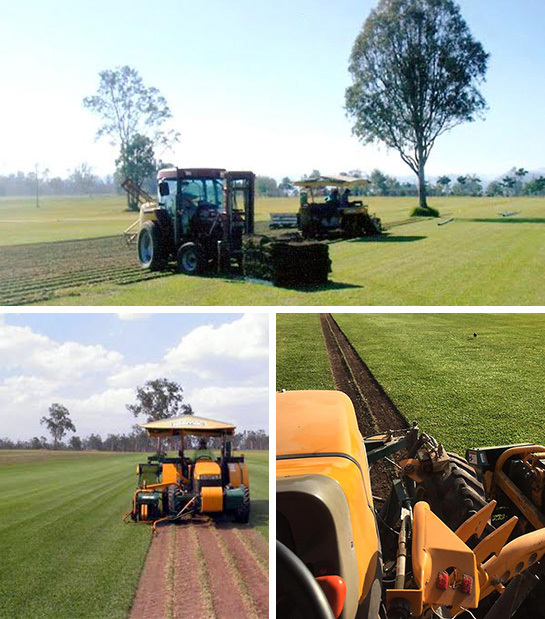 Premium turf suppliers to the Brisbane and Ipswich areas. Specialising in Sir Walter and Tropica turf varieties. Daily delivery to the greater Brisbane and Ipswich areas. Colliers Turf take pride in the knowledge gained over 48 years as a premium grower and supplier of turf. We are only to pleased to share this knowledge with our customers. If you have any questions regarding your turf project, just ask. © Copyright 2019 Colliers Turf Supplies. All rights reserved.